At Mahindra First Choice Services we strive to provide the best levels of service to all our customers ensuring they enjoy a safe and pleasant driving experience. We offer an extensive range of car repair services for cars of all makes and models all under one roof. We specialise in car services including wheel alignment service , car body repair , engine repair , denting and painting , brake repair , car grooming , road side assistance and much more. 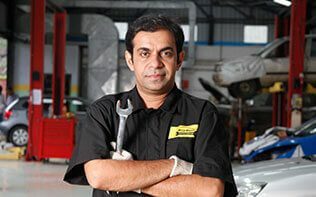 Our highly professional and trained mechanics use the best quality products combined with latest techniques for all car repair services. Book your service with us online or visit your nearest workshop today!